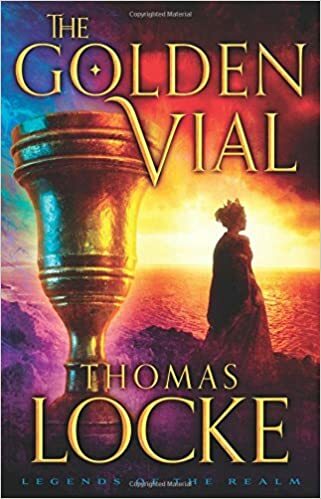 The Golden Vial is the latest in the Thomas Locke series Legends of the Realm. Where book one, The Emissary, introduces us to Hyam and his company of friends including his wife, and weaves a continuing story of friendship, loyalty, and sacrifice in book two--Merchant of Alyss--we see that book three, Golden Vial focuses solely on a new character. I may not have said it about book two, Merchant of Alyss, but Lady Shona makes an appearance and she's not yet a queen. But in this latest installment she is "the newly crowned queen of the realm...without a throne." I think the book is an amazing read, one that takes the reader on an amazing journey, and when read with both Emissary, first, and then Merchant, secondly, you'll see what I mean. It tells all of Hyam and Joelle's story. What I'm not going to do here is to burst the bubble of anticipation for Thomas Locke's latest book. You'll have to pick it up and read that for yourselves. For me, I loved the book, and I'm sorry I waited so long to even post this review up. Suffice it to say that this latest book will either make you want to re-read the whole series over again, or maybe not at all. What I can tell you is that overall I absolutely love the way Thomas Locke writes. So, who is Thomas Locke? Thomas Locke is the pseudonym for bestselling author T. Davis Bunn who has written books exceeding seven million copies in over twenty languages. He divides his time between Oxford and Florida, holding a lifetime passion for speculative stories. In terms of the stories he writes and tells under Thomas Locke, he has also authored the books Fault Lines, Trial Run and Flash Point; and Recruits and Renegades in the Recruits series. I received a complimentary copy of this book from Revell for my honest opinion and feedback.